In 1963, Arlington High School students Dennis Larson, Charley Peterson, Jerry Nelson and Alan Groon formed a band. Most of their initial energy was spent learning their respective instruments and finding time to get together after school and around farm chores to build a repertoire of songs. In 1964, after several months of practice, they developed a strong list of songs and played for school functions and dances in the area. 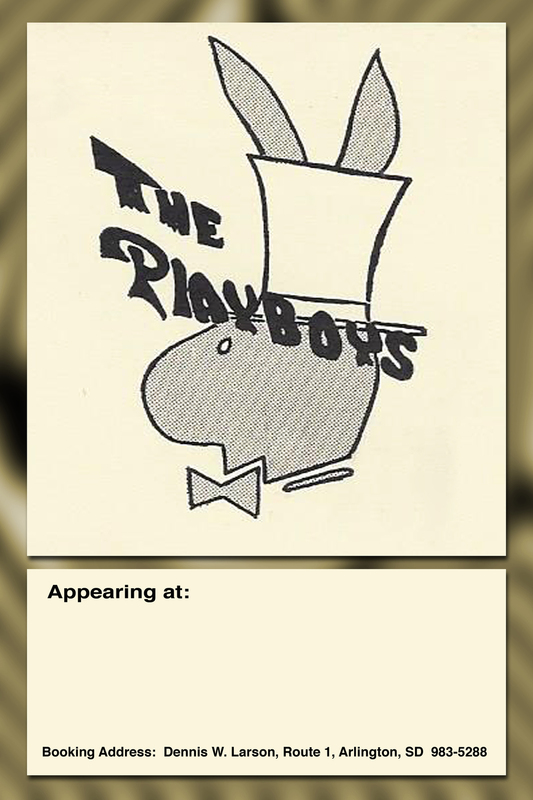 Early in 1965 they decided to name the band The Playboys. Doug Scheller and Larry Bennett, also from Arlington, joined the band, which eventually graduated from garage sessions to several small town dance venues and school proms and dances in Brookings, Kingsbury, and Hamlin counties. The gigs helped form a cohesive band and built a strong fan base. By summer 1965, Alan Groon decided to leaveThe Playboys. The others committed to a busy schedule that year without overdoing travel time. They played Ramona, Nunda, Erwin, Iroquois, De Smet, Lake Preston, Lake Norden, Dempster, and Estelline. This schedule included many gigs at Edwards’ Resort at Lake Poinsett, a favorite Sunday night meeting place for young people from Watertown and Brookings. They played several times at Don McCaskell’s Teen Town in De Smet. The Playboys played throughout the summer of ’65 and took a break until the summer of ’66. Dennis Larson left the band early in the summer of 1966, so the group was temporarily without a drummer. Jay Foster, from Estelline, replaced Dennis. It was also in 1966 that they renamed themselves The Toads, since Gary Lewis had gained fame with the Playboys name. While continuing to play in eastern South Dakota, The Toads performed as far west as Gettysburg and Miller and into Minnesota venues such as Tyler, Lynn, Marshall, and the famed Showboat in Lake Benton. The Toads rented halls and booked their own dances in several towns, particularly Iroquois, Estelline, and Arlington where the crowds often approached 500. Driving distance and time from gigs back to Arlington largely limited how far they could travel from spring through fall, as most band members could expect farm work waiting the next morning. While the band performed hits of the Beatles, Roy Orbison, Righteous Brothers, Buddy Holly, Kingsmen, Jerry Lee Lewis, Chuck Berry, “Surfin’ Bird” by The Trashmen was a staple for The Toads, who performed it by request multiple times at each dance. The crowds enjoyed instrumental solos, but the band found that the more they emphasized songs, the larger and more enthusiastic the crowds became. The Toads' fan base grew with their reputation. They performed through the end of 1966, when simultaneous calls from Uncle Sam spelled the end of the band. The members formed a tremendous bond with each other, the public, and musicians in other bands. Terrific memories and a great experience!